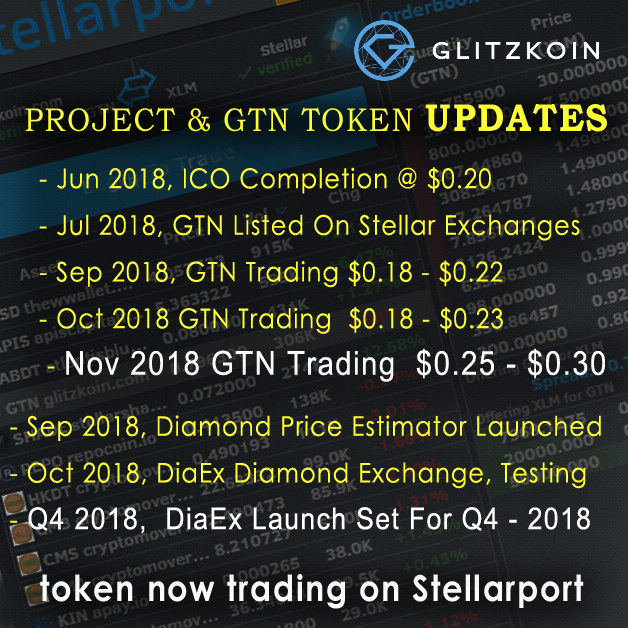 With the successful completion of the Glitzkoin ICO in June 2018 (ICO Price $0.20), the GTN token started trading on Stellar based exchanges in July 2018. The active support of crypto world enthusiasts, continued even after the completion of the ICO. The project entered the development phase of the DiaEx diamond exchange. The GTN token continued to be traded – the price range hovered in the $0.18 to $0.23 range. Consider the fact that most cryptos launched around that time, lost upto 80% of the ICO value and you would see why, Glitzkoin appreciates the strong support received from seasoned crypto space traders. Jump to November 2018 and the price of the Glitzkoin GTN crypto token, broke through that $0.23 roof, it made a brief stay in the $0.25 to $0.27 range and then, felt more comfortable at around $0.30. Analyzing those numbers, it is clearly visible that the token added 50% to its ICO value which was $0.20. So what exactly is the reason for the price rise of the GTN token. To begin with, we would not encourage wild speculation. The Glitzkoin project was focused on improving, market scope and efficiency for the 90 billion dollar diamond industry. Launching a token that would sway with rumors and market hype, was never our objective. We believe in steady and consistent growth and remain critically focused, on our main objectives. Much of the trade in the GTN crypto token, since the ICO and until now, has been conducted by knowledgeable crypto savvy participants. As laid down in the project plans, the GTN token will be the mode of payment on the DiaEx diamond trading platform. Both B2B and B2C trade will be supported, it is only certified natural diamonds that will be traded – no fakes and no synthetics. The price rise of the GTN token is obviously due to an increase in demand, this generated by the crypto world. On the implementation of the DiaEx diamond exchange which is scheduled for Q4 of 2018, the trading on the platform will itself generate another stream of demand for the Glitzkoin token. Seasoned crypto participants, have been waiting for this phase of the project. The only logical reason that can explain the price rise of the GTN crypto is the nearing of, the DiaEx launch. It is our opinion that, present or prospective buyers of the GTN crypto, should not make decisions based on rumors. Stay updated with the Glitzkoin project by visiting the www.glitzkoin.com website regularly.